It's Swedish, organic and contains no nasties: Estelle & Thild's RoseOtto line. 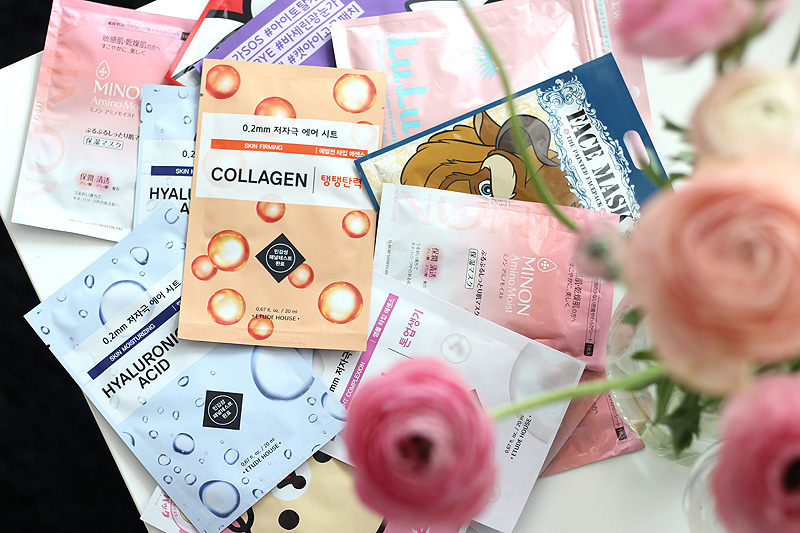 Having an oily skin can be quite an adventure. Some products make me break out during Summer, but are a true skin pampering gift during Fall & Winter. 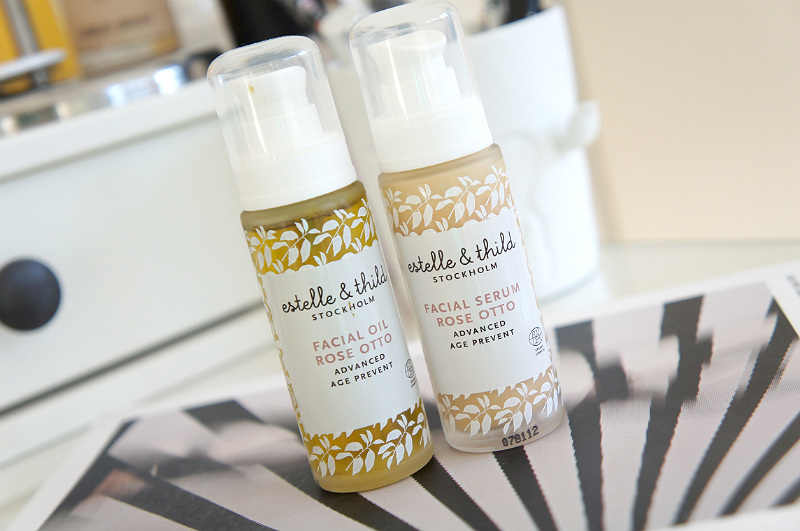 That’s also the story about me and Estelle & Thild's Rose Otto Facial Oil & Serum. It’s a Swedish brand created by Pernilla Rönberg for her two daughters named Estelle and Mathilde. When looking for a name for her new skin care line some years ago, she did not hesitate for long & named her skin care line after them, since she wanted her children to be able to use only the best organic skin care available. Pernilla didn’t want to use any chemicals in the line, so Estelle & Thild uses bio-active oils extracted from the purest organic raw materials, free from pesticides and toxic residues. That, and they’re free of all sorts of nasties. The two products are practically destined to be mixed together to create a beautiful night treatment. 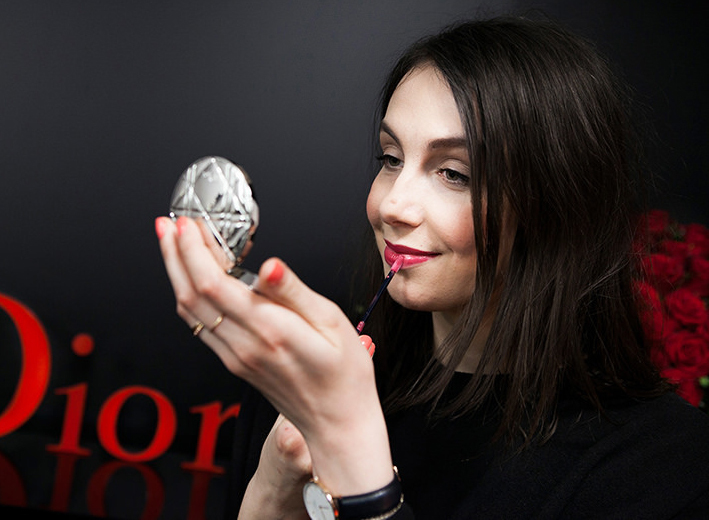 I like to mix two pumps of the serum with two pumps of the oil, and then I massage it onto my whole face and neck. 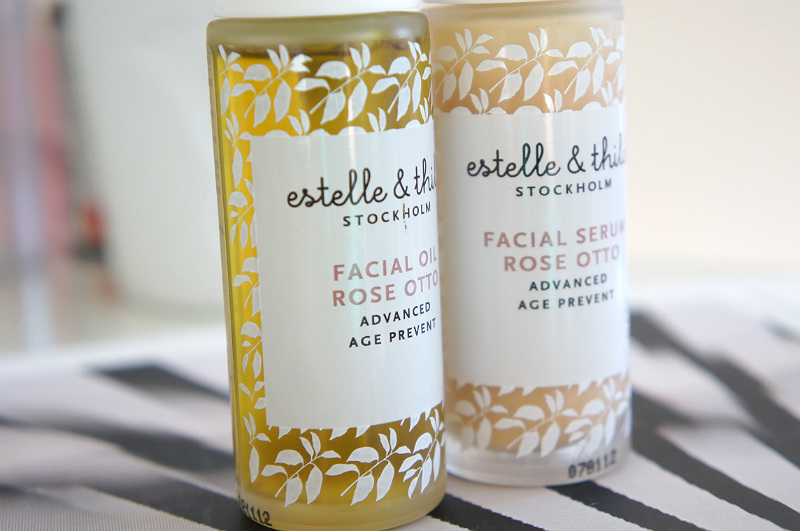 The Rose Otto line was designed to combat the first signs of ageing, but there’s another Estelle & Thild Anti-Age line that looks to be stronger than this one. I’d say that depending on your type of skin, you can easily start using this from your mid twenties on. Both products are packed with antioxidants and vitamins that are bound to do good things to your skin. Ingredients Facial Serum: Aqua, rosa damascena flower water*, glycerin, cucumis melo fruit extract*, alcohol, pinus sylvestris bark extract*, ribes nigrum leaf extract*, ficus carica fruit extract*, simmondsia chinensis seed oil*, castanea sativa flower extract*, dipalmitoyl hydroxyproline, rosa damascena flower oil*, parfum, cetearyl olivate, xanthan gum, sorbitan olivate, olea europaea leaf extract, citric acid, potassium sorbate, sodium benzoate, sodium dehydroacetate, limonene, citronellol, geraniol, linalool. I tried using these during Summer and had a bit of a break-out after the first night.. Four months later and a serious free fall in temperature, I’ve been wearing this combination every night and my skin is hydrated (I’ve been battling those dry patches you get during the first cold weeks in Fall), looks supple and is gaining back its Summer vibrance day by day. The scent of both products is really nice - think roses and good things, which is of course an added bonus! If you’re only looking to buy one of these, you can easily mix one pup of the oil into your night cream to enjoy those added skin care benefits. Estelle & Thild is available in Belgium exclusively at Senteurs d’Ailleurs in Brussels, but if you live elsewhere in Europe you can easily purchase the brand on BeautyBay. Both Rose Otto products retail for about €55, which is on the higher end but completely understandable given the organic ingredients.